Common name: Jacob's Ladder, abscess root, Greek valerian, blue bells, stairway to heaven, sweatroot. Type: Perennial Hardiness Zones 3–8 Bloom Time: late spring/early summer. Exposure: Light shade to dappled sun. Height: 18" - 24" Spread: 12" - 18"
Description: The leaves and flower stems grow from a vertical crown with abundant fibrous roots. The flowers are produced in panicles on weak stems from mid to late spring. They are 1⁄2 in long and have five light blue-violet petals that are fused at the base, enclosed by a tubular calyx with five pointed lobes. [1The pollen is white. The stigma extends beyond the anthers, making self-pollination difficult, so insects must cross-pollinate for the plants to produce seed. Pollinated flowers develop into an oval pod with three chambers, 1⁄2 in long, which is enclosed by the green calyx. The plant spreads by reseeding itself. Cultivation: Jacob's Ladder requires minimal maintenance. The initial bloom will last 2--4 weeks, with flowers opening from the tops of the stalks down. Once the flowers finish blooming, cut the flower stalks back to the plant's base. If the foliage starts to look tattered, it too can be cut back and cleaned up. New growth should replace the trimmed foliage. This plant is not aggressive; it is able to adapt to somewhat shady gardens that are located near deciduous trees. 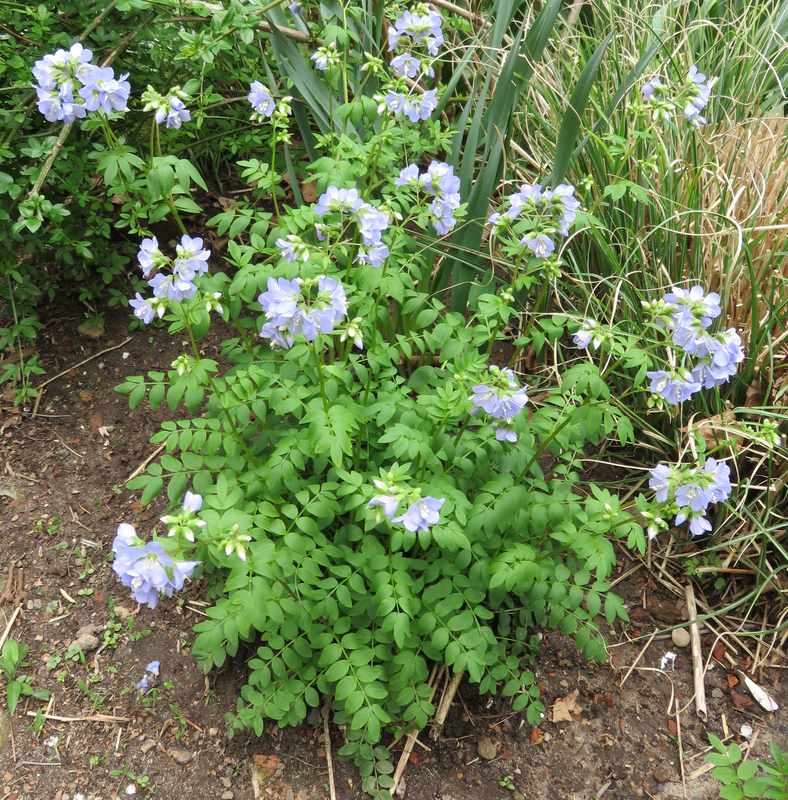 Fertilizing: Jacob's Ladder is a long-lived perennial. Give the plants a boost in early spring with a dose of balanced fertilizer, as the new growth is emerging. Once the faded flowers have been cut back, they can be fed again to encourage repeat blooming. Soil and pH: Jacob's Ladder is more fussy about moisture than about soil pH, but they will grow best in a loose, rich, well-draining, loamy soil with decaying organic matter with a neutral soil pH of about 6.2 - 7.0. Water: Plants that receive regular watering will bloom longer and remain attractive into summer. Pests & Diseases: Jacob's Ladder plants are generally problem free, but there are a few pests and diseases that will attack, particularly is the plants are stressed. The most common problems are sun scorch and insufficient water, which cause the leaf tips to start browning. Varieties with dark green leaves can handle more direct sun than the variegated varieties, if the soil is moist. Other potential problems include: Leafminers, slugs, leaf spot and powdery mildew. They are also apparently delicious to grounghogs. Propogation/Transplanting: Jacob's Ladder can be grown from seed or from division. Plants should be divided every 2 - 4 years, or they will start to die out in the center. They divide most easily and successfully in early spring. Carefully lift and separate the basal rosettes, replant and water well. Starting Jacob's Ladder Seed: If you already have a Jacob's Ladder plant, it will self-seed on its own. Jacob's Ladder can be direct seeded in either spring or fall. Loosely cover the seed with soil, water and keep moist and be sure to mark the spot so that you do not disturb it. To start seed indoors, sow either 2 months before your last frost date or in mid-summer, to transplant in the fall. Seed takes up to a month to germinate and should be keep moist until then. Transplant outdoors in spring, just before your last frost date, or in early to mid-fall. Notes/Garden Tips: Polemonium reptans is typically found in rich, moist woods, often along stream banks. Its range extends from Minnesota to New Hampshire in the north, and from Georgia to Mississippi in the south. It is most abundant west of the Appalachian Mountains. P. reptans has been traditionally used as an herbal medicine for febrile and inflammatory diseases, to ease coughs, colds and bronchial complaints, and to encourage perspiration. It is also said to bring relief in cases of inflammations and infections. The root is rarely used in modern herbalism. It is harvested in the autumn and dried for later use.